In the first two parts of this series on configuring a network services segment behind an ISA firewall, we began by going over concepts and considerations in creating perimeter networks. In part 2, we discussed the initial configuration of the network services perimeter ISA firewall. In this article we’ll complete the configuration of the network services perimeter ISA firewall by creating Web Publishing Rules, Server Publishing Rules and Access Rules allowing access to resources in the network services segment located behind the network services perimeter ISA firewall. Now we’re ready to create Publishing Rules and Access Rules that allow hosts on both the Corpnet ISA firewall Network and external clients on the Internet to access Exchange Server and File server resources on the network services segment. Hosts on the Corpnet ISA firewall Network will be able to connect to Exchange Server and file server resources by going through the network services segment perimeter ISA firewall. Hosts on the Internet will need to traverse both the edge ISA firewall and the network services segment perimeter ISA firewall. Later we will create the rules on the Edge ISA firewall to enable access to network services perimeter resources. In the scenario discussed in this series on creating network services segments using ISA firewalls, I will assume that you have already deployed your certificate infrastructure and have already requested the appropriate Web site certificates to support SSL/TLS connections to the Exchange Server’s e-mail services. If you haven’t done this and are not sure how to start, I highly recommend the ISA Server 2004/Exchange Server deployment kit documents I created for Microsoft over at http://download.microsoft.com/download/1/8/8/188ab94a-4ec5-4746-ac0f-a18177040fbf/isa2004se_exchangekit-rev%201%2005.doc (note that this is a single very large document; if you need an individual Word file that applies to your network configuration from one of the chapters in the deployment kit doc, then write to me at [email protected] and I’ll send you the separate doc). In the scenario used in this article series, we’ve bound certificates to the OWA Web site, the SMTP site, the POP3 site and the IMAP4 site on the Exchange Server on the network services segment. Table 1 shows the common/subject names on the certificates bound to each site. In the following sections we will create Access Rules, Web Publishing Rules and Server Publishing Rules with the characteristics listed in table 2. 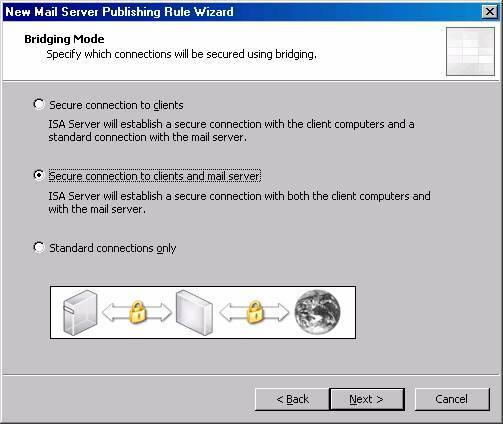 To simplify the configuration, we’ll leverage the ISA firewall’s Mail Server Publishing Wizard to create multiple publishing rules simultaneously. On the Welcome to the New Mail Server Publishing Rule Wizard page, enter a name for the rule in the Mail Server Publishing Rule name text box. In this example, we’ll name the rule Publish OWA and click Next. On the Select Services page, select the Outlook Web Access checkbox and click Next. On the Bridging Mode page, select the Secure connection to clients and mail server option. This enables SSL to SSL bridging. Click Next. 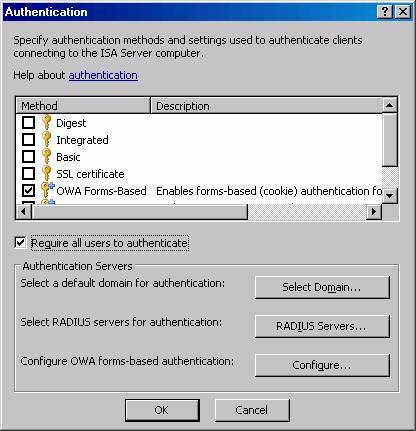 On the Specify the Web Mail Server page, enter the name on the Web site certificate bound to the OWA Web site. In this example, the name is owa.msfirewall.org. Keep in mind that the ISA firewall will need to resolve this name to the actual IP address of the OWA site on the network services segment. You can do this with a hosts file entry on the ISA firewall, or setup a split DNS infrastructure. The split DNS infrastructure might be challenging in this scenario, because as you’ll see later, we would need to create a triple split DNS to support name resolution for the ISA firewall itself, for hosts on the corporate network, and for hosts located on the Internet. While putting together a well-designed split DNS infrastructure is fairly simple, some network admins have misconceptions that it's either insecure or difficult to manage. Both misconceptions are patently incorrect and you should not fall prey to them. We will create the HOSTS file entry on the network services perimeter ISA firewall after we’ve created all the publishing and Access Rules. Click Next. On the Public Name Details page, select the This domain name (type below) in the Accept requests for list. Enter the common/subject name on the Web site certificate that will be bound to the Web listener for this Web Publishing Rule. 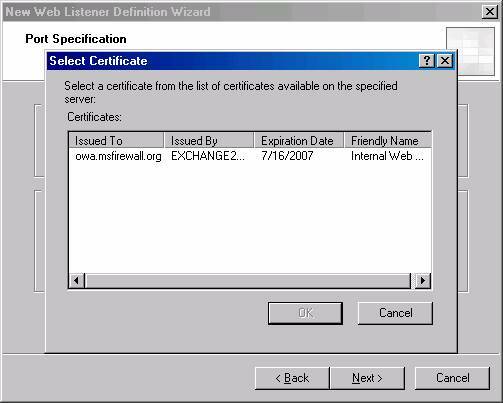 In this example, we have exported the Web site certificate bound to the OWA Web site and imported it into the machine certificate store on the ISA firewall. Because this is the same certificate, it has the same common/subject name. 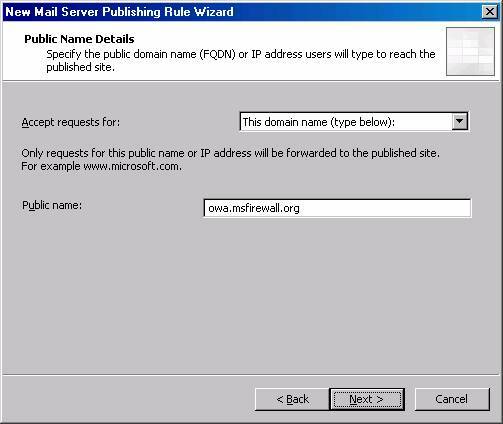 Therefore, we enter owa.msfirewall.org in the Public name text box. Click Next. On the Welcome to the New Web Listener Wizard page, enter a name for the listener in the Web listener name text box. In this example we’ll name the Web listener OWA Listener. Click Next. On the IP Addresses page, put a checkmark in the Corpnet checkbox and click Next. 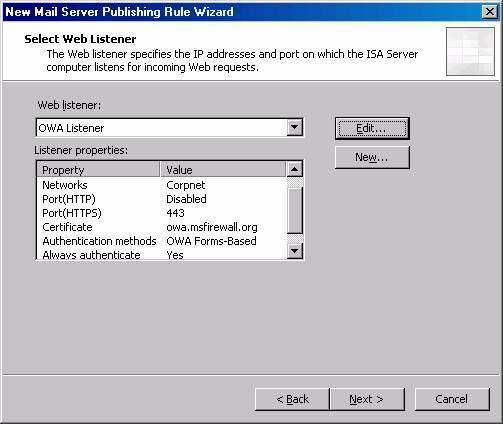 Select the OWA Web site certificate from the list in the Select Certificate dialog box and click OK.
On the OWA Listener Properties dialog box, click the Preferences tab. In the Authentication dialog box, remove the checkmark from the Integrated checkbox. Click OK in the dialog box informing you that you don’t have any authentication methods configured. Put a checkmark in the OWA Forms-based checkbox. Put a checkmark in the Require all users to authenticate checkbox. Click OK.
OK in the OWA Listener Properties dialog box. Your firewall policy should like that seen in the figure below. The next step is to create the Server Publishing Rules that publish the rest of the Exchange Server services. These include Server Publishing Rules for Secure Exchange RPC, SMTP, POP3 and IMAP4. 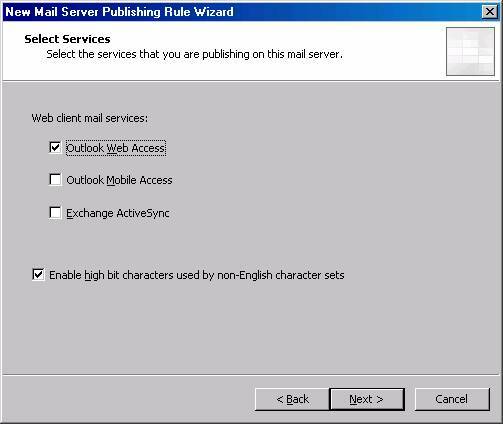 We have the option to create these rules separately or create them all at once by using the Mail Server Publishing Wizard. We’ll use the latter option to simplify things. Because we are using a Route relationship instead of a NAT relationship between the source and destination Network, we can’t bind a specific IP address to the listener used in the Server Publishing Rule. When you use a Route relationship, the Server Publishing Rule listens on all addresses bound to the external interface using a feature known internally as port stealing. Because both the Secure Exchange RPC server Server Publishing Rule and the RPC (all interfaces) component of the intradomain communications Access Rule are listening for similar communications, we end up with a conflict that prevents Outlook MAPI clients from connecting to Directory services. If there were a NAT relationship between the Corpnet and the network services segment, we could bind multiple IP addresses to the external interface of the network services perimeter ISA firewall. Then we could create two rules: one for Secure Exchange RPC publishing and the other for RPC (all interfaces) and use a different listening address for each of the rules. Machines on the Corpnet ISA firewall Network then connect to Secure Exchange RPC services or RPC (all interfaces) services using the IP address used for their respective rule’s listener. This works because connections are made to the IP addresses on the ISA firewall’s external interface when you have a NAT relationship between the network services segment and the Corpnet ISA firewall Network. It doesn’t work when there is a Route relationship between the network services segment and the Corpnet ISA firewall Network because hosts on the Corpnet ISA firewall Network connect to the Exchange server using the actual IP address of the Exchange Server. Since the hosts are connecting to the IP address of the Exchange Server itself and not an IP address on the external interface of the ISA firewall, the ISA firewall’s port stealing mechanism must listen and intercept RPC communications on all IP address of the external interface. This breaks the granularity required to allow both a Secure Exchange RPC Server Publishing Rule and a RPC (all interfaces) Access Rule on the same ISA firewall when there is a Route relationship between the source and destination ISA firewall Networks. You can confirm this by creating both a secure Exchange RPC Server Publishing Rule in the scenario used in this article series. Then attempt to make a connection to the Exchange Server from the full Outlook MAPI client using RPC (don’t use RPC/HTTP, since the inbound connection is HTTP, so the ISA firewall doesn’t see the RPC communications tunneled in the HTTP header). 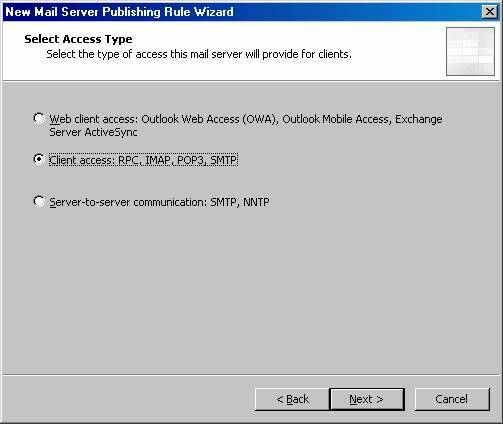 You’ll that the connection seems to establish successfully, but if you open the Connection Status window in Outlook 2003, you’ll find that the RPC connections are successful only to the Exchange Server’s Mail Services. No connection is established to Directory Services. On the Firewall Policy node, click the Tasks tab on the Task Pane and click the Publish a Mail Server link. On the Welcome to the New Mail Server Publishing Rule Wizard page, enter a name for the rule in the Mail Server Publishing Rule name text box. In this example, we’ll name the rule Exchange Server and click Next. 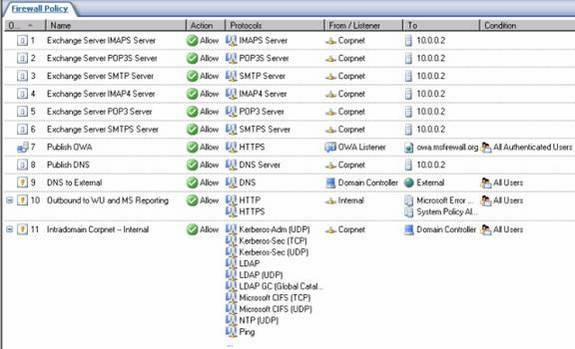 On the Select Access Type page, select the Client access: RPC, IMAP, POP3, SMTP option and click Next. On the Select Services page, put a checkmark in each of the checkboxes. 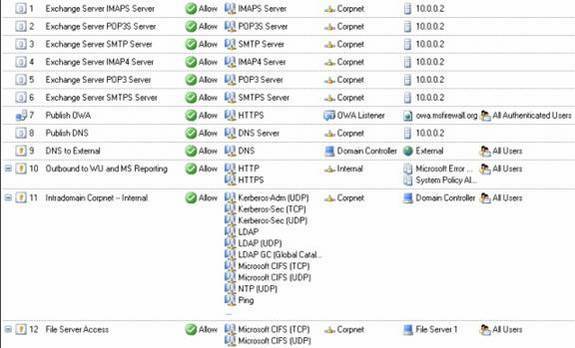 This will allow us to connect to the Exchange Server on the network services segment through the network services perimeter ISA firewall for all the services listed on this page (with the exception of the Exchange Server’s NNTP service, we could create a separate rule for that if required). Note the comment on the page regarding the SMTP Message Screener. We will not deploy the message screener in this example, but you might want to consider it in your own deployment. 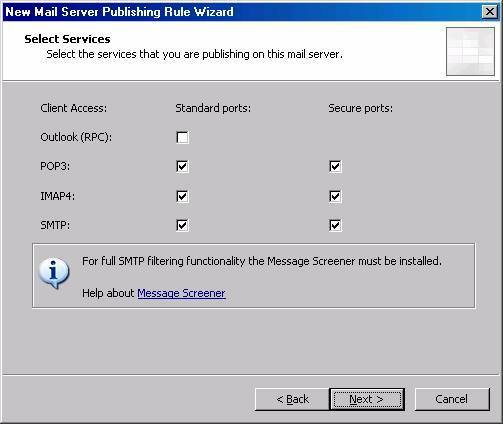 You can install the SMTP Message Screener on the ISA firewall to filter both inbound and outbound mail. Even though the SMTP Message Screener won’t be enabled, the SMTP filter is enabled and will protect SMTP communications moving through the network services perimeter ISA firewall. Click Next. On the Select Server page, enter the IP address of the Exchange Server in the Server IP address text box. In this example, the Exchange Server’s IP address is 10.0.0.2, so we enter that value. Click Next. On the IP Addresses page, put a checkmark in the Corpnet checkbox. Click Next. Your Firewall Policy should appear similar to that in the figure below. Note that the Mail Server Publishing Rule Wizard added seven new Server Publishing Rules. Click Apply to save the changes and update the firewall policy. Click OK in the Apply New Configuration dialog box. Now we can create the Access Rule allowing connections to file shares on the file server on the network services segment. We can enable either NetBIOS protocols or Direct Hosting (TCP 445). In this example we’ll enable only Direct Hosting, which is more efficient than NetBIOS protocols. On the Firewall Policy node, click the Tasks tab in the Task Pane and then click the Create New Access Rule. On the Welcome to the New Access Rule Wizard page, enter a name for the rule in the Access Rule name text box. In this example, we’ll name the rule Publish File Server. Click Next. 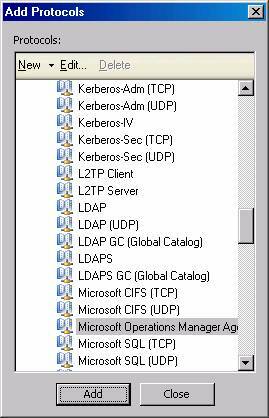 In the Add Protocols dialog box, click the All Protocols folder and then double click the Microsoft CIFS (TCP) and Microsoft CIFS (UDP) protocols. Click Close. Click Add on the Access Rule Sources page. 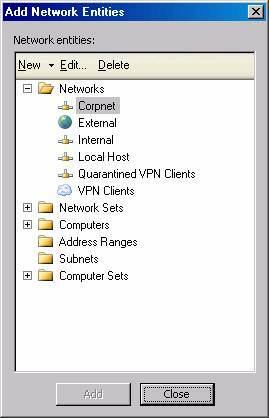 In the Add Network Entities dialog box, click the Networks folder and then double click the Corpnet entry. Click Close. 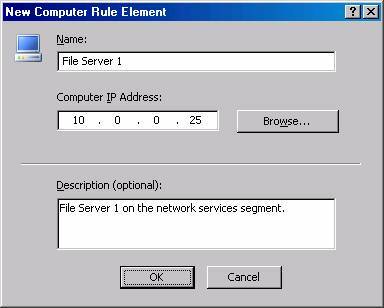 In the New Computer Rule Element dialog box, enter a name for the file server in the Name text box. In this example, we’ll name it File Server 1. Enter the IP address of the file server located in the network services segment in the Computer IP Address text box. Enter an optional description if you like. Click OK.
Click the Computers folder in the Add Network Entities dialog box and double click the File Server 1 entry and click Close. Your firewall policy should look like that in the figure below. In this article we finished up the configuration of the network services perimeter ISA firewall. 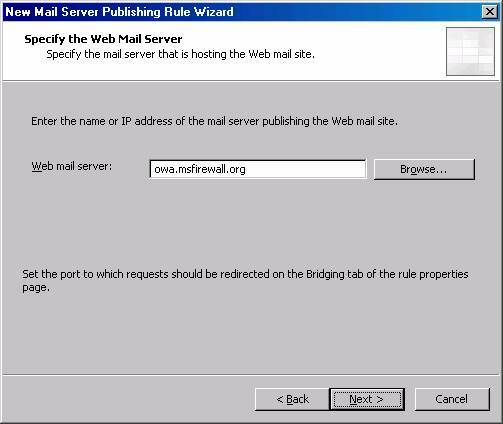 We used the Mail Server Publishing Wizard to create a Web Publishing Rule allowing connections to the Exchange Server’s OWA, SMTP, POP3 and IMAP4 services. No Server Publishing Rule was created to allow access to the Exchange Server’s secure RPC services because of an issue related to the intradomain communications rule. In part 4 of this series, we will move our attention to configuring the edge network ISA firewall and hosts on the Corpnet ISA firewall Network.